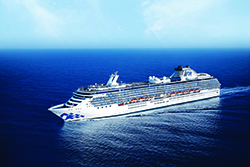 Coral Princess,® with more than 700 balcony staterooms, was custom built to navigate the historic Panama Canal. Be sure to try the Bayou Café & Steakhouse? , which features New Orleans-inspired Cajun and Creole cuisine, join friends for cocktails and Movies Under the Stars® by the pool or try some decadent treats at the International Café.